March 2018: Smart remained the top-selling electric car brand in Germany but the VW Golf was the best-selling electric car model ahead of the Renault Zoe, Smart Forfour and Fortwo. January to March 2018: Smart was Germany’s largest electric car brand with sales well ahead of Volkswagen, Renault and Kia. The Smart Fortwo remained Germany’s favorite electric car model but the VW Golf is catching up and was ahead in March 2018. Electric cars took just over a percentage of the total German new passenger vehicle market thus far in 2018. The German electric car market expanded by 80% to 9,102 new electric passenger vehicle registrations during the first three months of 2018. However, with the total German new car market growing by 4% to 878,611 passenger vehicles, electric cars had only a 1,04% share of the total new car market in Germany. In March 2018, a total of 3,792 electric cars were registered for the first time in Germany for a market share of 1,09%. This was a 73.1% increase from March 2017. The sale of electric vehicles to especially private buyers is hindered by supply problems as manufacturers seemed unprepared for demand. Autobild reported that unexpected demand for popular models such as the Renault Zoe and e-Golf means waiting times of more than six months while deliveries of the Hyundai Ioniq Electric may be delayed for up to a year. Smart maintained its lead in the German electric new car market, as it was the best-selling electric car brand in all three first months of 2018. Smart had a market share of 28% of the German electric car market. Volkswagen remained in second place and with its 19% share of the electric car market remarkably close to its share of the overall German new car market. All indications are that VW will follow its traditional cautious approach of being late to market but then in full force. Renault is the only other brand to have sold more than a thousand electric cars in Germany during the first three months of 2018. 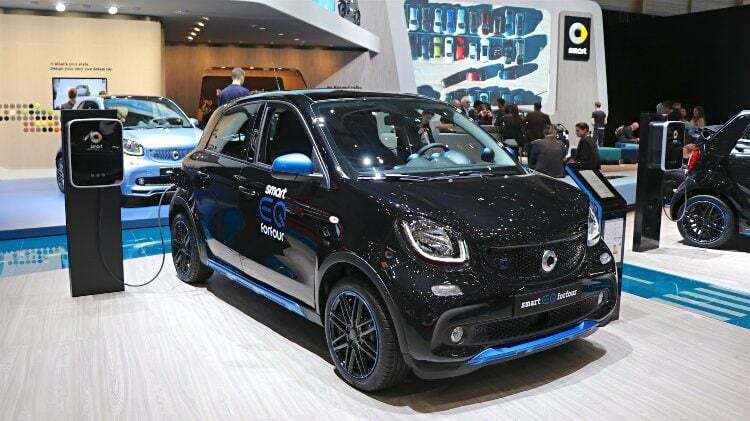 Thus far in 2018 the Smart Fortwo has been the best-selling electric car model in Germany but it was outsold in March 2018 by the VW Golf, Renault Zoe and Smart Forfour. The Kia Soul, BMW i3 and Tesla Model S sold over 300 cars each in March 2018 while the new Nissan Leaf deliveries also started to propel the world’s best-selling electric car back into the top-10 list in Germany. For other models, electric car registrations in Germany remain dismally low with many representing research vehicles rather than cars sold to consumers.